I’m still working up the hat pattern, but I just had to share this baby sweater pattern asap! It’s the perfect baby cardigan for spring and summer, or those who live in year round warmer climates – super lightweight and airy, just warm enough to ward off a chill. The big stitches and hook make it fast and drapey, while the asymmetrical front and broomstick lace make it new and different. 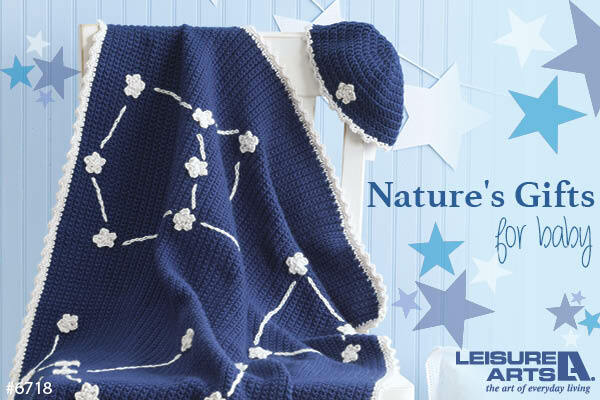 Sized for the average 3 month old, it’s a perfect gift for any newborn! This sweater features broomstick lace for the bottom half. If you are not familiar with broomstick lace, I’ve filmed a video tutorial! There is also a quick written set of instructions below in the Special Terms section. Klik hier voor een PDF van dit patroon in het Nederlands! Loop Pass – In broomstick lace, all stitches are worked from the right side of the fabric. The first half of the technique is the loop pass, worked from left to right. Without twisting, transfer the loop on your hook onto the knitting needle. Skip the first stitch, and going into the blo, pull up a loop from each stitch and place it on the needle. You should have as many loops on your needle at the end as you had stitches in the previous row. Do NOT turn. Return Pass – This is the second half of a broomstick lace row. Working from right to left, Insert the hook into the first 3 sts and pull them off the needle. Holding the loops somewhat taut so they don’t loose height, bring the working yarn loosely up behind the loops, yo and pull through. Ch1 (this is the only ch of the row) and work 3 sc, going through the center of all three loops each time. Using the hook, slide three more loops off the hook and work 3 more sc in this set. Continue to end, working 3sc into each group of 3 loops. At the end you should have as many sc as you had loops. Do not turn, but use the loop on your hook at the end of the last sc to start the next row of Loops. For all sizes, ch 35. Note: If you are using Lion Brand Baby Wool or other small skein yarn, now is a good time to change skeins so that you don’t have to change in the middle of the broomstick lace section. You can use the bit left over from the first skein for edging the sleeves. If you are making one of the larger sizes, you’ve probably already had to start a second skein! Row 12-19 (14-23, 16-27) (all RS): Repeat last two rows for 5 (6, 7) total broomstick lace rows. Add more length in pattern as desired. Do not break yarn. Edging: Staying on the RS, work sc evenly up the inside front edge of the sweater, across neckline, and down other front edge. When back at the bottom, work sc in blo across, break yarn, use seamless join and weave in ends. Prefer a short sleeve or vest style sweater? Just work a row of sc around the armhole openings and you’re done! For longer sleeves, continue as written below. To minimize seaming but keep the broomstick lace motif going, the yarn is attached to the body of the sweater at the shoulder and then the sleeves are worked flat from there, so the only seaming is the actual sleeve itself. If you prefer not to seam the sleeves, you can join each round and work plain hdc all the way down to the wrist. Break yarn leaving 12″ tail for seaming. Seam up the sleeve from wrist to armpit. Edging: Join yarn with sl st to RS of wrist opening near seam. Ch1 and working in blo, sc around wrist. Break yarn, use seamless join, and weave in ends. Sew the button(s) to the inside, shorter flap of the sweater. Make chain loops long enough to go around the buttons and sew them in behind the edging of the longer front flap. For 1″ buttons, I chained 10, but you’ll need to play around a little to see what works for the buttons you choose. What do you think? Do you have any little ones in mind for this sweater? 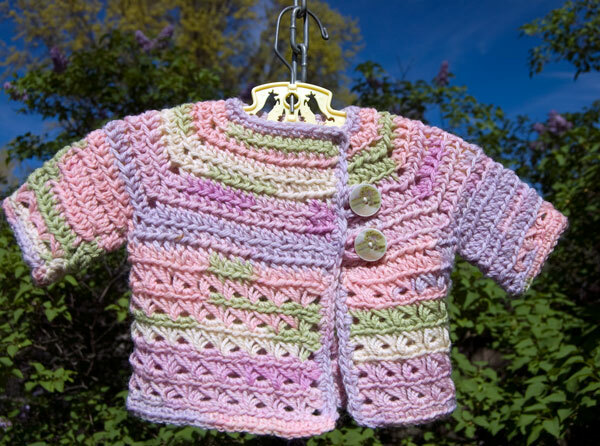 What’s your favorite spring or summer baby gift? Written pattern copyright Tamara Kelly, 2012. 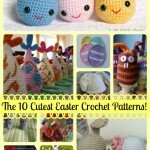 Please use a link to this page when sharing this pattern with others. To print this pattern for personal use, please use the green Print Friendly button below, or go to PrintFriendly.com. This is beautiful. I look forward to making this for a sweet little miracle! Thank you for sharing. Thank you so much for sharing,this is beatiful. I’m interesting to make it in bigger size for my little boy (4 year) would you like to give me the bigger patern?. Ah, that’s quit a bit of upsizing! You’ll have to give me some time to do the math on that one! This sweater is beautiful! Thank you! 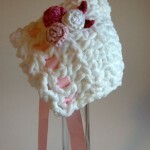 The baby for whom I would like to crochet it is now 4 1/2 months. I don’t know how soon I will have the time to crochet the sweater, so I would appreciate instructions for the next two sizes up. I’ve never done broomstick lace, but I’ve just watched your tutorial. It is very well done; I’m looking forward to practicing this technique. Thank you for your help! Hi, I love this sweater and look forward to making one later on. This is an adorable sweater! I love the colors you chose for it. It is definitely in my Ravelry favorites and in my queue (actually, going to start it as soon as I submit this comment). I love the seamless and the quick aspects of it (I waller in crafter’s ADD(can’t really say suffer with it ’cause there’s nothin’ troublesome about it…not for me anyway (maybe DH who sees all my ‘stuff’ hehe)). Where, oh where did you get those gorgeous buttons???? Thanks Jeanne! I got the buttons at JoAnn Fabrics. perla, unless you are a very loose crocheter I’m afraid it’ll be tiny! The pattern calls for worsted weight 4 yarn and a 6mm hook – if you go down in both yarn weight and hook size you’ll be shrinking it. Using a sport weight yarn and a bigger hook might work though, or you could try making the largest size with what you’ve got and see if it lands on 0-3 months. Aim for a 16 inch chest measurement and you’ll be on track. LOVE this sweater…but I would really like to make an adult size…there’s some math for ya! lol!!! Seriously, if you know of a similar pattern, or will be doing the math anyway, I would love to make something like this for me and my grown-up girls! 🙂 Thank you!!! Oh wow! Um… yeah, that’s a whole lotta math! My advice would be to find an existing cardigan pattern you like and then just make the broomstick lace for the bottom! What a darling little sweater! 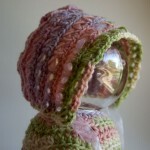 I just had this pattern brought to me in an email from HookedOnCrochet! I’ve added it to my Rav queue and will be printing it ASAP and looking for the perfect yarn. Thanks so much for making this pattern public. this is a very cute sweater. However since its November its pretty cold and getting colder…is there anyway to make the sweater suitable for the weather. could you also please post your respond to my personal email. you have a beautiful little ones outfit. thank you so much for sharingt it. I love this sweater. Is there any way you could send instructions for 18 months to 3 years. Hi Cheryl! I’m glad you like the pattern! Coming up with that math may take a while though… What I’d recommend is finding the chest measurement of the child you have in mind, and then repeating Row 2 until you have reached that width. Then make the armholes row, and for the setup row, add enough stitches to get to a number divisible by 3, spacing them evenly around. Then work the broomstick rows as directed, making however many groups is appropriate for your stitch count. I hope that helps! Thanks for saying so! Alas, I no longer have the sweater (or bonnet), having gifted them, and I used up all that yarn. Also, I never have been able to find standardized neck measurements for babies. What I can do is tell you that the neck opening should be close to 10 inches or so when finished, judging by how it hangs on the hanger (still have the hanger!). I know that seems small, but my 5 year old’s neck is just now 10 inches around, so it should be plenty. Keep in mind too, that the top button is a couple of inches below the neckline, so you gain a lot of room there too. Help. I can’t understand row 3 of the sweater for size 0-3 mths. If you crochet in the two ch3’s under the arms and also make the 18+ increases you end up with more then 75 hdc. I can’t keep ripping out and need help. Love the pattern, I make sweaters for charity and would like to use this patter. Hi Margaret! I think you’re referring to Row 9? I do see a problem there, you’re right, the stitch count is off! I will fix that now! You are right, it is row 9. Thanks for fixing it. I’ve tried to make the bodice section twice today, but I can’t get the increases to line up diagonally. The stitches are made in the loops between the stitches in the previous row, so should I always increase between the 1st and 2nd stitch of the group of 3 in the previous, or teh 2nd and 3rd? And do I then change when I work on the wrong side? Hi Sharon! There should be 42 sts in the first row, and 5o in the 2nd row. You place 4 markers in the first row, and then in row 2 you make 3 sts in each marked st. So in every marked st, you are increasing by 2 sts. An increase of 2 sts in 4 places means 8 additional sts, and of course 42 + 8 is 50. Does that help at all? I am having trouble with the sleeves. It say HDC around and you have 20 stitches. What about the chain 3 stitches that formed the armhole? Thank you so much for sharing this pattern. Also, a big thanks for the video on broomstick lace. How do I get rid of this so IO can read the pattern. very frustrating. Hi, Can you please tell me what I am doing wrong?… I am having a problem getting 42 sts in row 1….when I chain 35 and do the pattern I’m always ending up with 8 or 9 sts at the end of the row and not 11! I’ve tried this 3-4 times and I always end up with only 39 or 40 sts! Also I have bought a lighter weight wool and wondering if that will work with this pattern. Hi Kristine! Easy one first, using a lighter weight wool will likely result in a slightly smaller sweater. Now, as for stitch count, that’s a tough one without being there. Maybe breaking it down will help. You chain 35, but since you skip the first one as the turning chain), there are really only 34 chains to work in. So you hdc in the first 4, which leaves 30 chains. Then you work 3 hdc in the next chain, which leaves 29 chains. Then hdc in the next 3 chains, which leaves 26 chains. 3 hdc in the next chain leaves 25. Hdc in the next 9 leaves 16. 3 hdc in the next leaves 15. Hdc in the next 3 leaves 12, 2 hdc in the next leaves 11. Does that help at all?